Wrapping paper and gift wrap supplies can be tough to keep organized because they’re awkward sizes and take up a lot of space! 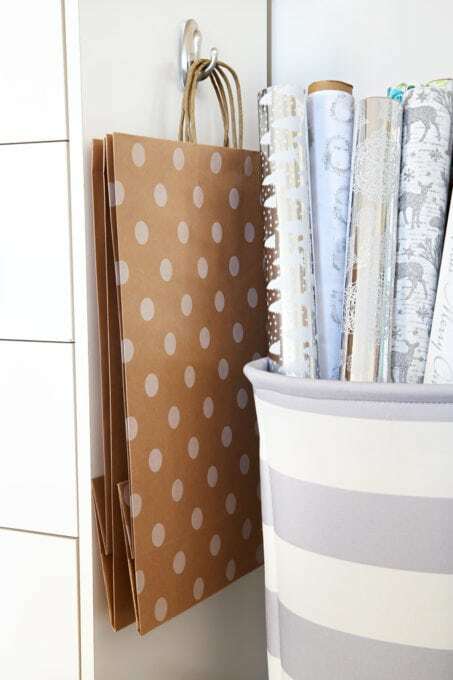 To fix that problem, we created an organized gift wrap station, and now wrapping presents is quick and easy! ‘Tis the season for giving gifts, and that means lots of gift wrapping too! Admittedly, since we moved into our house (a little over a year now– eek!) I have found myself avoiding wrapping gifts because I didn’t have a good system in place for my supplies. Everything was all spread out in different places around the house, so every time I needed to wrap a present, I had to go searching through a bunch of different messy bins to find the supplies I needed. With Christmas coming up, I couldn’t take the messy non-system anymore, so I decided to solve my problem by putting together a little gift wrap station! Now it would have been awesome to have custom built-ins created with a cute little gift wrapping area all built in, but that takes time and can get expensive, and I wanted to have something set up in time for the holidays, so I just searched my house and tried to work with what I already had. It’s amazing what you can make with a little creativity! The first thing I needed was a way to corral all of my gift wrap. Gift wrap rolls are long and awkward, so it can be challenging to find a way to store them that keeps them from becoming a mess but still allows me to grab them quickly and easily. 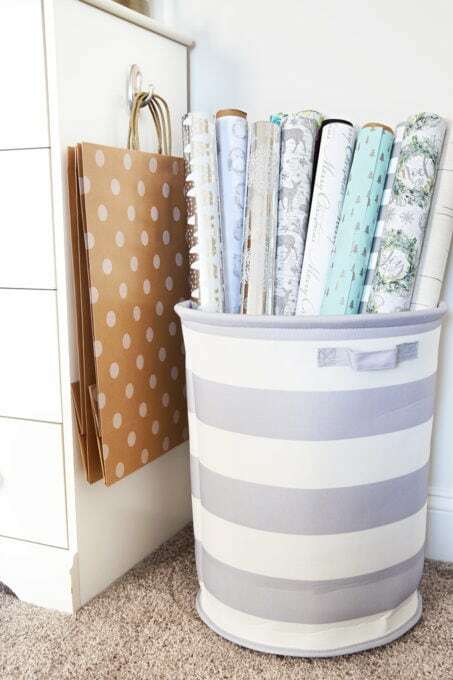 I grabbed a tall round bin that I already had (I have also used it to hold toys in my boys’ playroom and as a laundry hamper. ), and it holds up my rolls neatly so I can see everything I have and pick out what I need. Next, I needed something to hold the rest of my wrapping supplies. 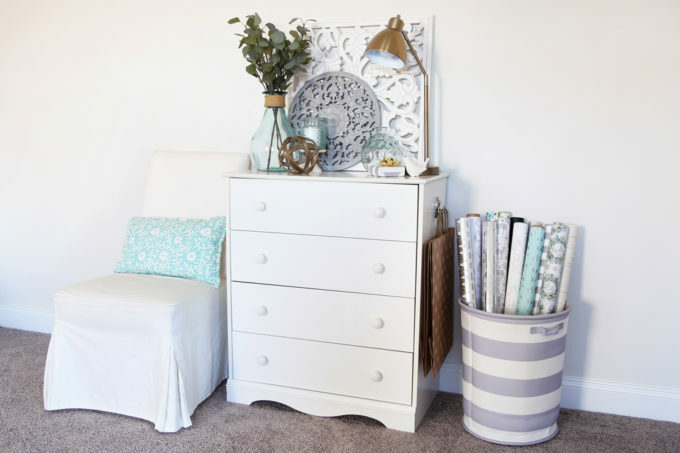 I thought about using a rolling cart or even a wooden chest that we had, but I settled on a little white dresser that was actually in my office already. My boys had two dressers in their room in our old house but they just use one in our current house, so I had this one left over and thought it would be the perfect thing to hold my gift wrap supplies. Let’s take a look inside the drawers! The first thing I did was put down a pretty drawer liner. I always think this makes the drawer look a little nicer, and it’s easy to wipe down as well when I need to. I had some extra SKUBB boxes from when I organized our clothes, so I used those inside the drawers to corral different items. If you don’t have any extra bins lying around, shoe boxes are great to use too– and they’re free! I have even wrapped mine in pretty paper to give them a uniform look. 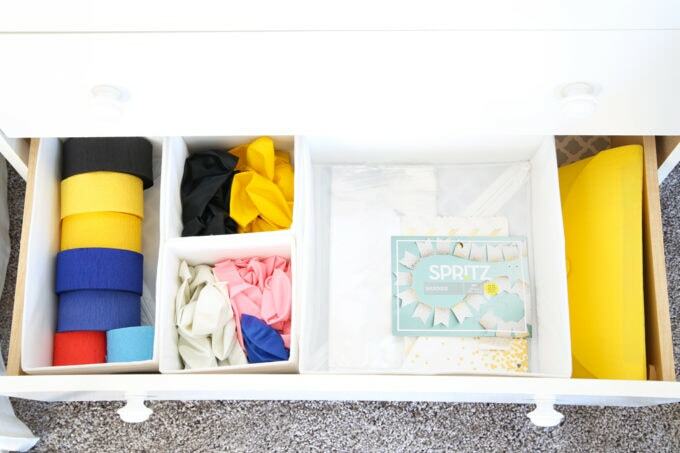 The top drawer has a bin for bows and one for ribbon. Then I have two smaller boxes: one holds my tape, and the other has gift tags. I also keep a pen in the drawer to write out my tags, along with a pair of scissors. Then in the back corner I keep a little container of paper clips; I use these to clip on my wrapping paper so that it doesn’t become all unraveled and messy in the bin. I had a few gift bags that were too big to fit in the drawer, so I stuck a little command hook to the side of the dresser and hung the big bags on it. It keeps them neat and tidy, and when my hook is empty, I know it’s time to buy more bags! Since my dresser is pretty roomy, I even had room for some items that aren’t actually gift wrap, but I had already been storing them with my gift wrapping supplies, so I wanted to keep them close by. 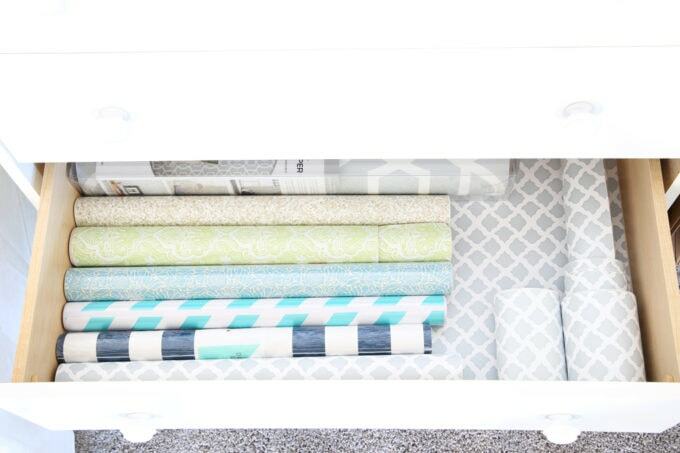 My third drawer holds all of my different patterned drawer liners, including some smaller scrap pieces I like to keep around in case I have any gaps that I need to fill when I’m lining cabinets or drawers. Finally, the bottom drawer holds a few party decorations, which I also like to keep with my gift wrapping supplies. I have streamers in a bin, a few bins for balloons, and then a bin that has an extra banner and some favor bags inside. I also keep a little organizer in this drawer that holds different types of greeting cards. Each of the sections is labeled, and any time I need a card for anything, I can just come in here and grab one without having to run to the store. So that’s how I’m organizing my gift wrap and supplies these days! It really helps to have it all in one place so that it’s easy to find when I need it. I’m keeping mine in my office, but in our old house I actually had this dresser in the bottom part of a long closet to maximize every inch of space, so that could work too, to keep it out of the way! 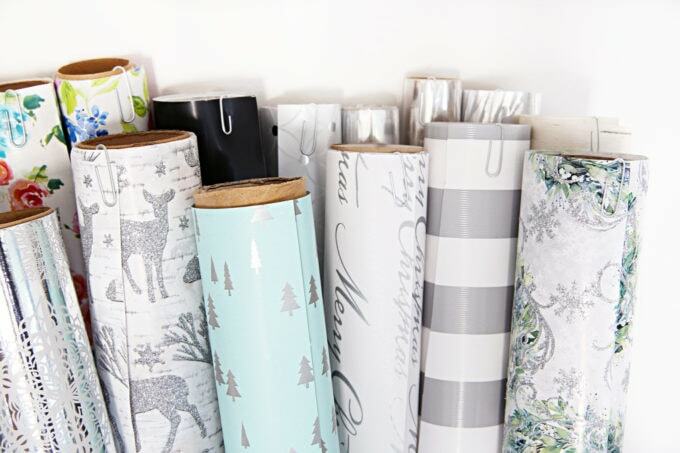 There are so many possibilities for storing gift wrap depending on your space and what items you have on hand to store it– let me know how you organize your gift wrap and supplies in the comments! 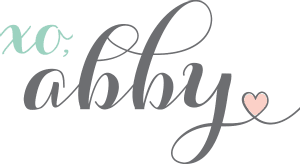 Oh Abby, You are amazing!!! Everything is so beautiful, I feel calmer about the upcoming rush just looking through your wonderful photos (even your wrapping paper is coordinated, a high standard indeed for this wrapping paper junkie!). Could you come organize my house just a few days ought to do the trick lol! I’m inspired, there is hope even for my wrapping station to come to order! 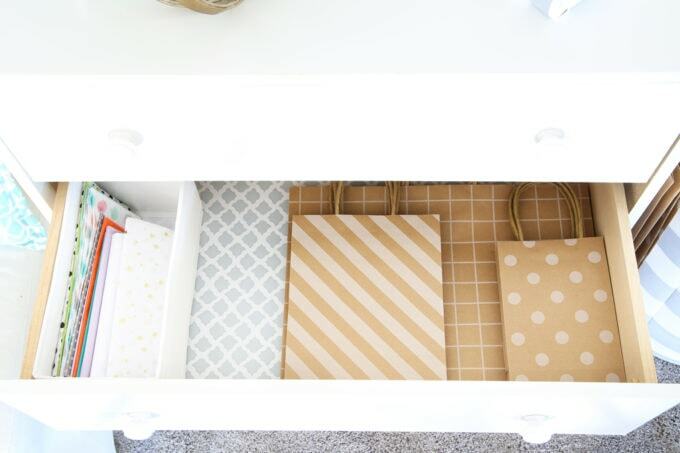 Where do you buy your drawer liners? Hi, Claudia! My favorite is from Amazon and is linked in the description of today’s video! Thanks! I use the Pax Komplement pull out tray in my Pax to store gift wrapping paper (url included in website).. I also have one for large sheets of thin cardboard. The pul out trays are not cheap, but my paper and cardboard is stored neatly and out of sight. OMG STOP IT! That’s so freakin beautiful! I am so inspired now! i’m def gonna see if I can do this in my own home. Hi Abby! 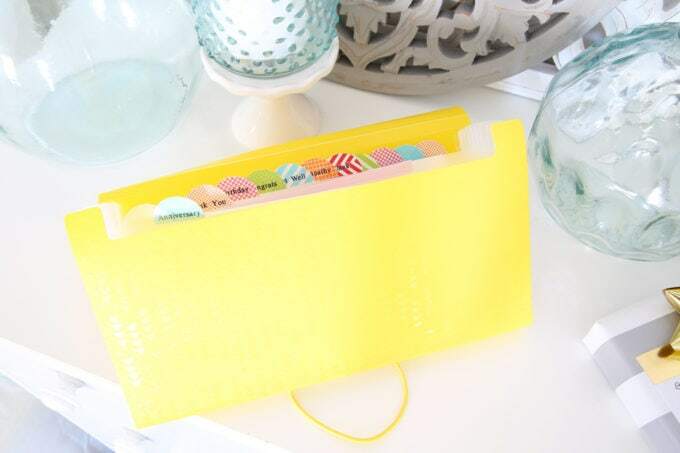 I will try this organization for my gift wrap. I currently have the roll out long tote containers. But I need more room and having a bin like yours would be so ideal for me to be able to see what I have. Thank you for the idea! This is great! 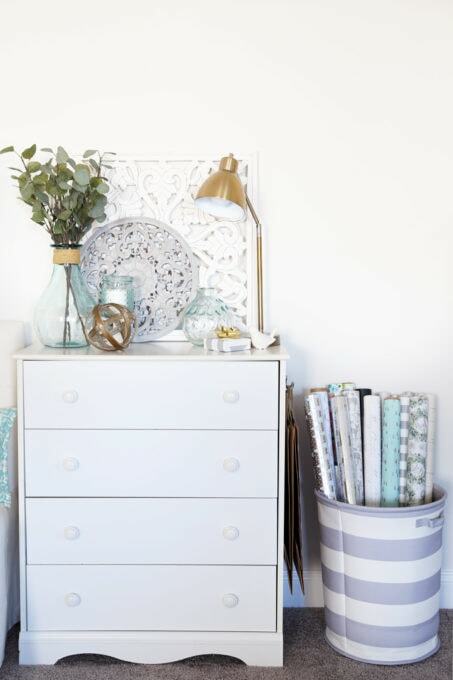 Unfortunately I don’t have an extra dresser, nor do I have the room to create a gift wrap center like this, anyway. Any alternative ideas for those of us with little room to spare? Hi, Soni! Other options would be bins that are stored under the bed, a hanger on the back of a door, or I’ve seen people use a smaller set of plastic drawers inside of a closet as well! 🙂 I hope this helps! Your system is much prettier. Hi, Caroline! Thank you so much for your sweet words! I think there are about 15 rolls in there right now, and it could probably fit another 10 at least…so a lot, lol! Hope you’re having a great week! This is the most clever idea and so useful in the coming weeks! Thanks for sharing! You are the sweetest, friend! Thank you! Hope you’re having a great week! I am obsessed with wrapping presents this time of year. Growing up I was always the person wrapping everyone presents, family, friends, neighbors, everyone! Aw fun! I love to do the wrapping in our house too! Hope you’re having a great week! 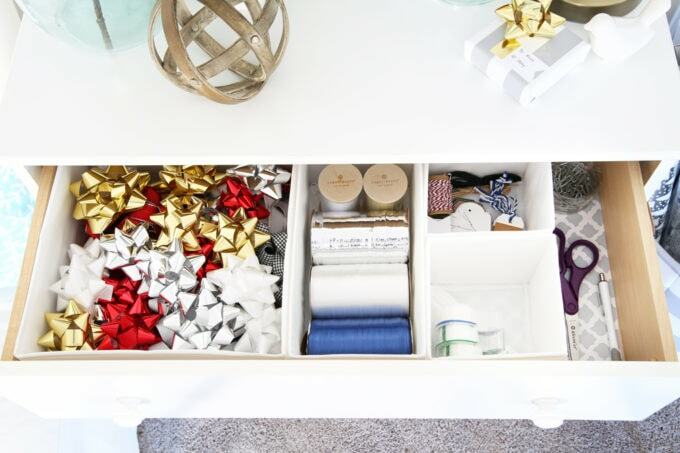 This is such a cute gift-wrapping station. I feel exactly the same way you felt before putting this station together. I actually love wrapping gifts, but it’s hard to feel excited when you have to walk the whole house searching for different items so you can wrap one single present. I hope to be able to create a little station like that when we move to a bigger house. Thank you so much for your sweet words, Isabel! It’s amazing how motivating a little organization can be, lol! 🙂 Hope you’re having a great week! I also use a dresser for my gift wrap supplies. Maybe I’ll get it more organized like yours, but the drawers are wide enough that my rolls of paper lay nicely in the second drawer.Ribbons, bows are in the top drawer.The dresser was my daughter’s dresser/changing table when she was a baby 37 years ago! Oh I so need this!! I may have to set something up in the laundry room or a closet, but that would be better than digging under the bed and random drawers! Just knowing where everything is will help cut down on buying a bag because I can’t remember if I have any! God, I wish I could organize my gift wrapping! I always just put everything in a large clear bag and hope to be able to find it again next year, I think wrap stuff on the bed because there is no table space! Organization, why do you bring me such sorrow!